Review posted March 22, 2019. Candlewick Press, 2019. 52 pages. 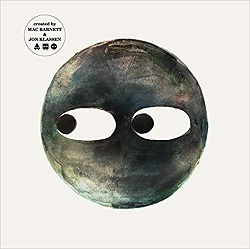 This is the third book in a Shapes trilogy by Mac Barnett and Jon Klassen, where the characters are large shapes with eyes. I wasn’t crazy about the first two, and thought Triangle was just plain mean-spirited, but I’m really taken with Circle. The story is simple. Circle’s planning a game of hide-and-seek with Square and Triangle. Circle tells them the rules, and the main one is no hiding behind the waterfall because it’s dark back there. Well, when Circle opens her eyes, Square is just standing there, pointing. Triangle broke the rule and went behind the waterfall. This one’s fun. I love the look of the pages, especially the lovely misty waterfall contrasting with the distinct shapes. And then it plays with the dark shapes – and bright eyes – in the dark behind the waterfall. The final line asks the reader an imaginative question, and I’m going to use this book in a storytime just to find out what kids will say.